The other day I jokingly said that the presidential candidates should work a few shifts in a busy kitchen to learn valuable lessons about America. The more I think about it this seems like a pretty good idea. I am sure that there are many other fields where this same scenario could play out, but since restaurant work is my background, I thought it might be interesting to see what these candidates could learn from a week of 12 hour days on the line, working in 100 degree ambient temperatures, feeling the pressure of relentless orders, and feeling the internal stress of wanting to do exceptional work. So… here is a sampling of the lessons that our candidates might learn, and if they did, think about how the picture before us might change. As Andre Soltner, one of America’s truly great chefs once said: “Never forget that we are cooks”. This was in response to the growing misuse of the term “chef” and the changing role that some with that title were taking on in restaurants. 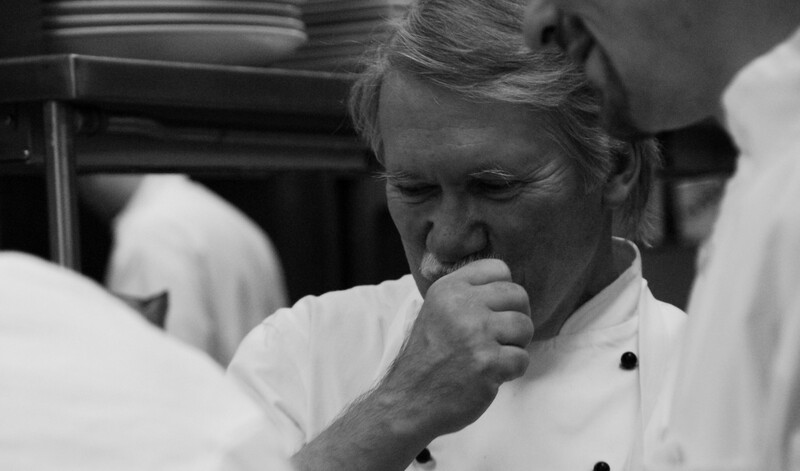 He epitomized the title of chef and demonstrated the humility to not let a title go to his head. A restaurant is never just the chef; a restaurant is a team of people working together for a common goal. A country is never just the person who holds the consummate title of leader; it is a unified group of individuals who share a common set of beliefs and morals that define who they are in everyone’s eyes. Every race, ethnicity, religion, shape, size, color, and political belief is represented in many kitchens across the U.S. It is this diversity that makes kitchen work so interesting, educational, and enjoyable. The candidates might actually be able to put aside their ways of categorizing people and simply look at them as valuable coworkers and compatriots with a common goal. It is one thing to talk about the importance of the American worker and how they built this country, it is another thing all together when you are actually one of those individuals who spend their time, each and every day, making something that they can put their mental and emotional signature on and say: “I made this.” If our candidates were to experience this feeling then they might gain a new appreciation for the need that we all have to make tangible goods that we can take pride in. It seems far too often that political figures tend to worry about serving their personal needs before those of the population that they represent. Everyone who works in a restaurant understands (although we do occasionally gripe about it) that our job is to service the needs and desires of the people who choose to patronize an operation. The mantra for a successful restaurant is: “If you are not serving the guest directly then you should be serving someone who is.” Wouldn’t this be a nice change of pace in Washington? This is a far-reaching trait that appears to be lacking in our political figures. In restaurants we learn to respect our fellow workers, respect the chain of command in the back and front of the house, respect the farmer and producer who allows us to use their ingredients, respect the vendors who do the same, and respect the guest who spends money in the restaurant and allows everyone to earn a paycheck. The lack of respect for anyone and anything (especially this year) in the political arena is appalling. Communication is not a one-way process. Communication in the kitchen requires that we listen as well as state our own thoughts and opinions. Without this communication and respect for others comments and points of view, kitchens wind up in chaos. Wouldn’t it be great if this same logic applied to Washington? Can you imagine how much important work would get done? There are few guarantees in the public sector. Whether it be a restaurant or any other business – employees are never certain of what tomorrow might bring. The wages that most restaurant employees earn do not allow for much in terms of frivolous spending, structured saving, or sometimes even paying those ordinary bills that fit under the heading of “survival”. This is true with many jobs in America – a lesson that our political leaders should experience and learn to understand. Above all else in the kitchen – employees need to feel that they can trust one another; that each person will do his or her job as expected, within the timeframe of need, and that they will show up when needed – ready to go. Trust and dependability seem to be words without much meaning among our representatives as of late. If we expect this of our fellow workers shouldn’t we expected it of those who we elect to represent our country’s best interest? Tell it like it is! Sometimes we (restaurant folks) are chastised for maybe being too honest with our observations, feelings, and comments, but if those comments are based on fact and are delivered with equality, then isn’t this more valuable than lies, and stretched reality? What can we believe today from our political leaders without fact checking from our news source of choice? Business, small business in particular, is the backbone of the American economy. These entrepreneurs are the people who built this great country. There are more than 1 million restaurants in the United States today and although we see chain operations in every city and town, there are actually more small private restaurants in America than those with a corporate logo. These small businesses do not have the advantage of marketing departments, legal counsel, advertising budgets, lines of credit, or excess funds to properly care for all of their employees like they would like to; yet they are subject to the same regulations and challenges that the large companies have. The only difference is they are unable to weather the storms. Our leaders could learn, first hand, what it is like to build a successful business in our country. Pay scales aside – every person who works in America is looking for the package that will allow them to enjoy the comfort of security. Security that allows them to receive the medical care that they need, security that gives them an opportunity to save for their future, security in knowing that if they are sick – they can still pay their bills while they take care of themselves. How many restaurant workers show up to work when they are quite ill simply because they can’t afford not to. A sick day is a day without pay. How would our leaders feel if this were the case for them? Unless you are actively involved in the food system (farmer to table) the products that you consume do not have any real meaning. The challenges that farmers face, the difficulty that producers face in getting products to market, and the choices that they may have to make because our government fails to view the food system as anything more than an industry, is something that seems to fall quickly from a politicians agenda. Walk the fields, harvest a crop, sit down with a farmer when they look at a mounting pile of bills that can only be paid if they adopt processes that they might not philosophically agree with, then make your decisions on important votes related to food integrity. Restaurant people are, by nature, generous folks. We are some of the first businesses that others go to for help, and in most cases we give willingly. “Tis better to give than receive” is something that restaurateurs through history have aligned themselves with, even when they can ill afford to do this. It would be nice to see a little more giving on the part of our political figures. As a cook works his or her way up to a restaurant chef position, it is essential that they have the answers or at least know where to find the answers. Cooks and chefs are constantly learning and typically have made a commitment to do so. In recent months I have found it appalling that some political figures fail to understand what is going on in the world, what their intended jobs entail, and fail to see the need to learn as much as they can. In the end, isn’t it all about working to be a person who has strong beliefs, is strong enough to state those beliefs and back them up, and is committed to staying true to this personal philosophy (stakes in the ground) because they represent who you are and who you will always be? When was the last time we could say about a politician: “I never doubted his (her) integrity”? Integrity is the foundation of a great restaurant and the most essential ingredient of a great country. ***Don’t ignore your right and responsibility to vote in November.